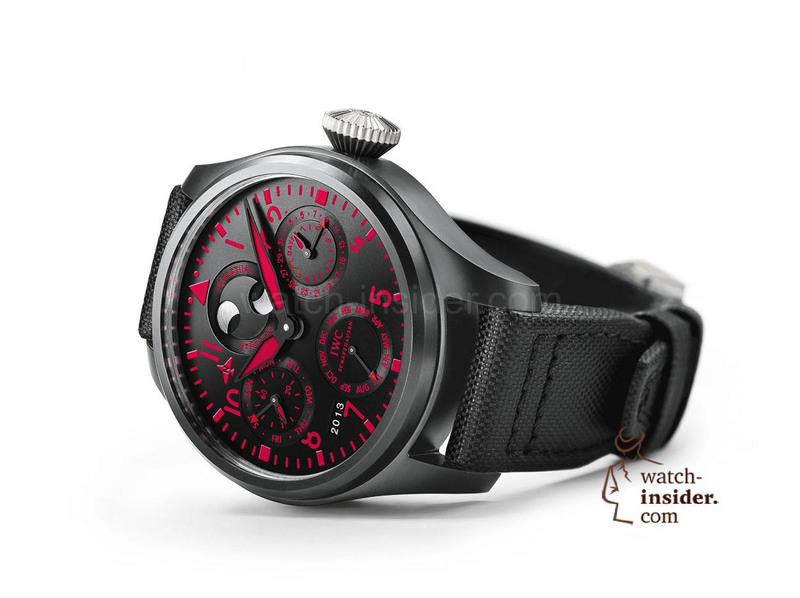 Milano – Munich – Paris, the IWC Schaffhausen Portugieser Chronograph Rattrapante is back! With 3 new versions, each dedicated to one of the cities mentioned above, the legendary IWC chronograph with the third push-piece located at “10 o’clock” is celebrating its rebirth. 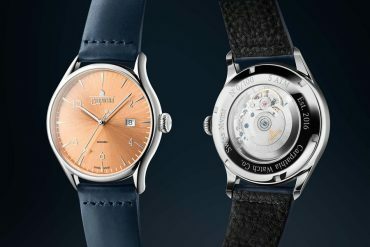 When first launched in 1995 the Portugieser very quickly became a ticking star, even more this Portugieser became a style icon. I have to admit this chronograph was for a long time my absolute favorite! The IWC Schaffhausen Portugieser Chronograph Rattrapante was last launched in 2006, but among collectors and IWC-fans never forgotten! In addition to the capabilities of a “pure” chronograph, this Rattrapante chronograph also features a split-seconds mechanism. 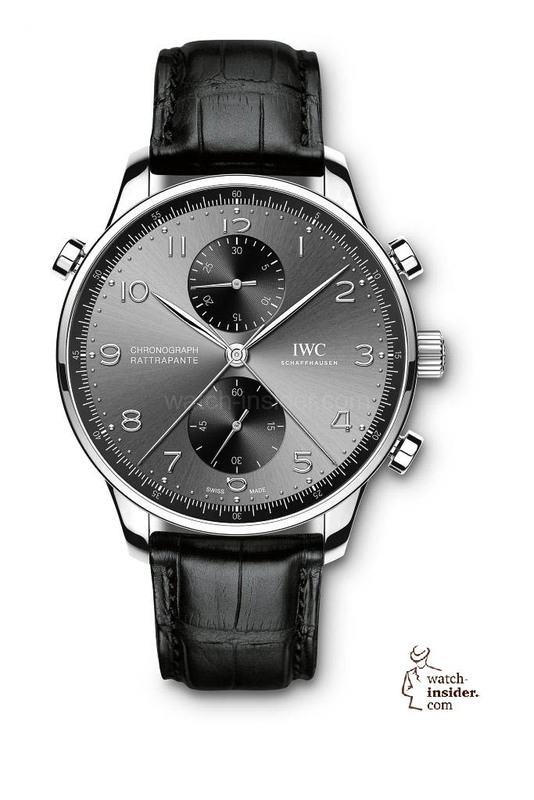 On starting the chronograph, two centrally rotating stopwatch hands – mounted one above the other – are set in motion. The additional push-piece at “10 o’clock” is used to stop the upper hand, while the lower hand continues to move until the regular stop push-piece at “2 o’clock” is operated. This enables two short periods of time to be measured simultaneously. 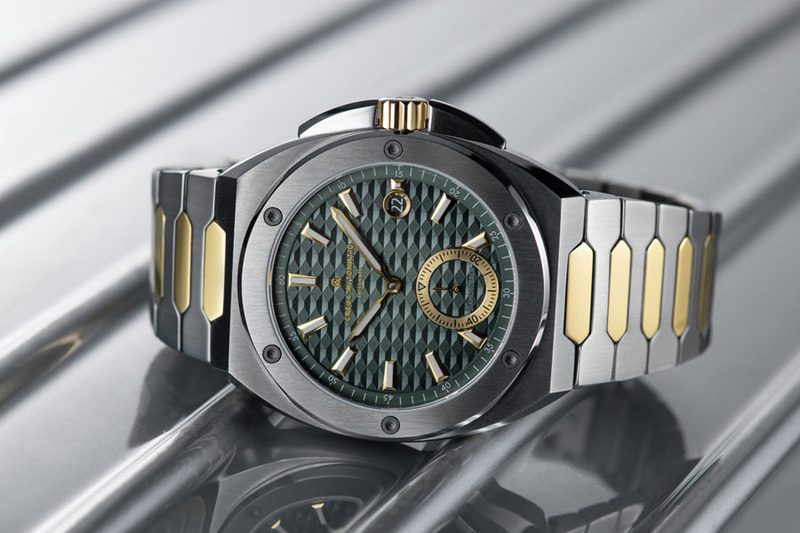 When the rattrapante push-piece is activated a second time, the split-seconds hand is brought into renewed synchrony with the chronograph hand – irrespective of whether this has been stopped or is still moving. Now the IWC Schaffhausen Portugieser Chronograph Rattrapante returns to the markets, to be precise in the IWC-boutiques of three European cities. … and 250 in the “Boutique Munich” (Ref. IW371217), with a stainless-steel case, blue dial and blue alligator leather strap. The display on these models is based on the original design of the IWC Schaffhausen Portugieser Chronograph Rattrapante from 1995. 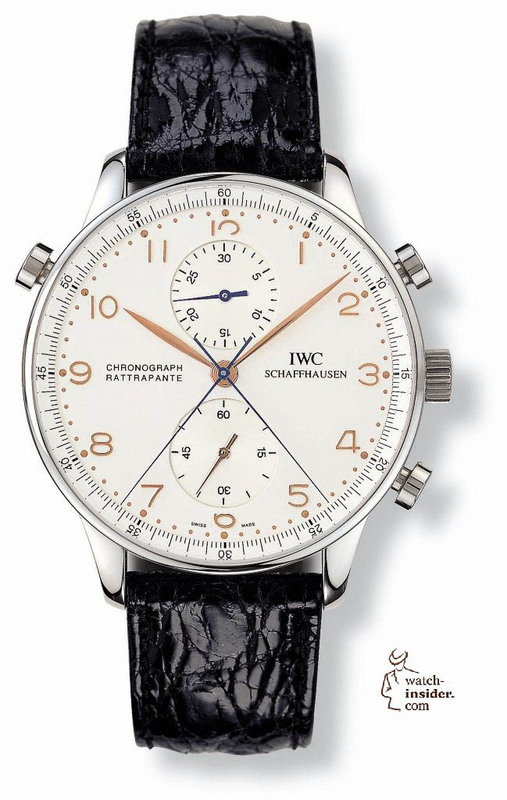 The 1995 IWC Schaffhausen Portugieser Chronograph Rattrapante Ref. 3712. 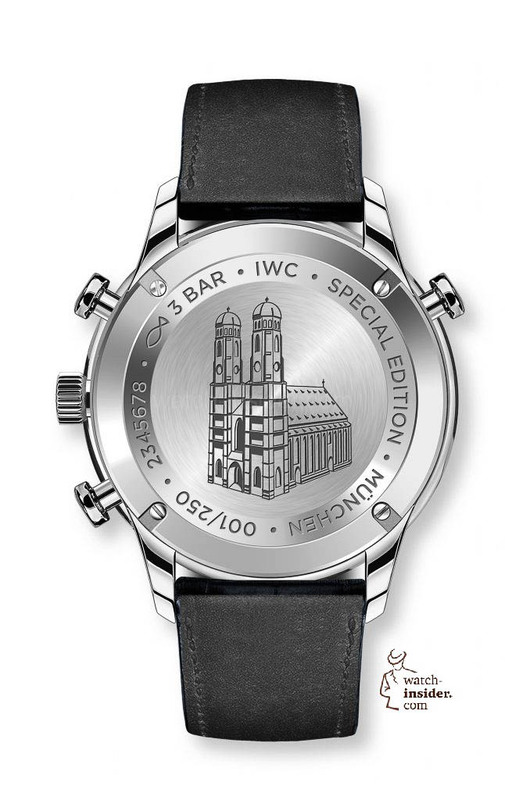 The engravings on the back of the IWC Schaffhausen Portugieser Chronograph Rattrapante show icons or landmarks from the respective cities. 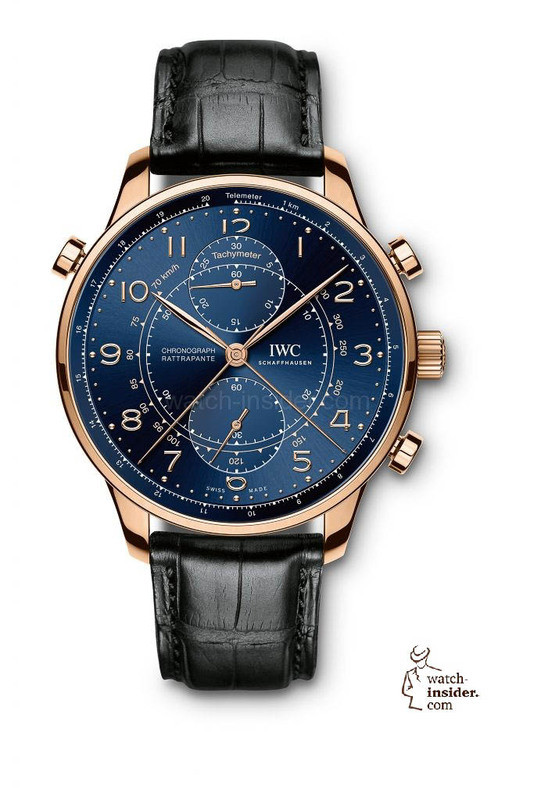 All three IWC Schaffhausen Portugieser Chronograph Rattrapante are powered by the hand-wound IWC 76240-calibre with a power reserve of 44 hours. Waterloo (1815-2015). Breguet & the Hougoumont farm. Financial support for the preservation of cultural heritage. 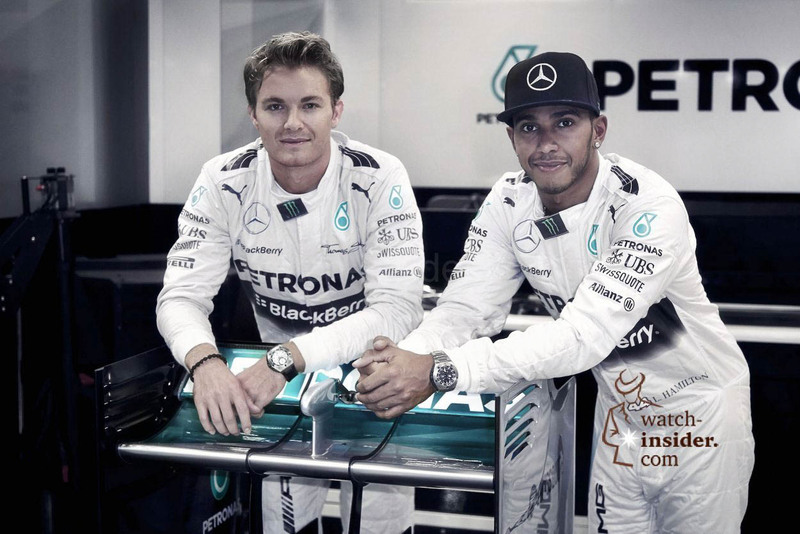 Lewis Hamilton versus Nico Rosberg. This time it is not about Formula One racing but two IWC chronographs. Which one do you prefer? Of course they look nice, but I don’t like the cut numbers 6 and 12. Better would be a simple point. And the price – as always at IWC – is too high. 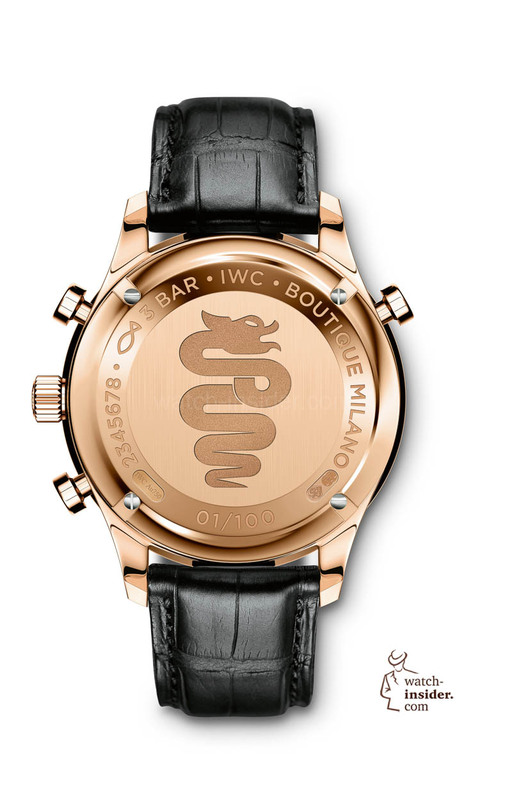 I like all three, of course I am biased, as IWC is one favourite brands. I like the same as you the Stainless steel Boutique Milano! Really like the Ardoise ( Grey) dial combination. Plus, it’s not as “busy” as the Red Gold variation. 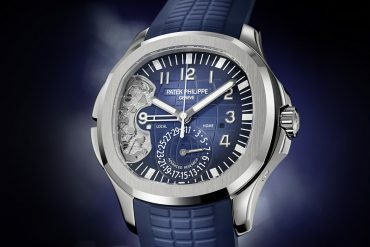 Blue dial would be my second choice. Glad to see this model return. As IWC usual …beautifully executed. 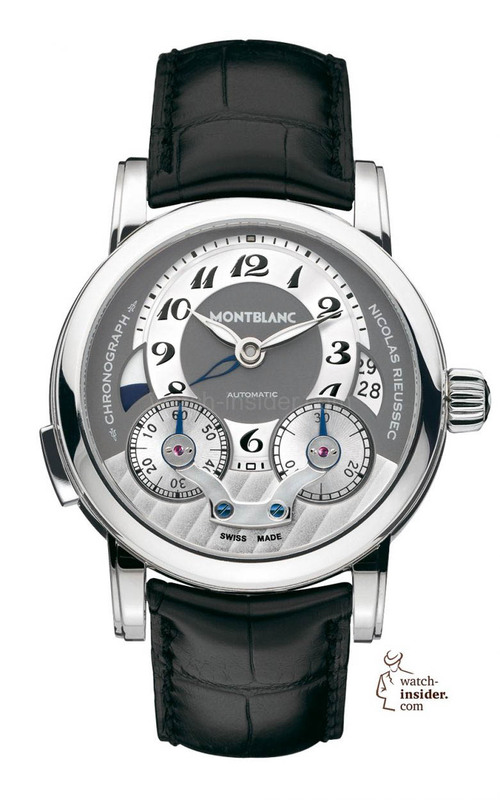 The Nicolas Mathieu Rieussec Seconds Chronograph was the inspiring example for the Montblanc Rieussec Chronograph. I have pictures for you showing the original chronograph from 1821/1822.